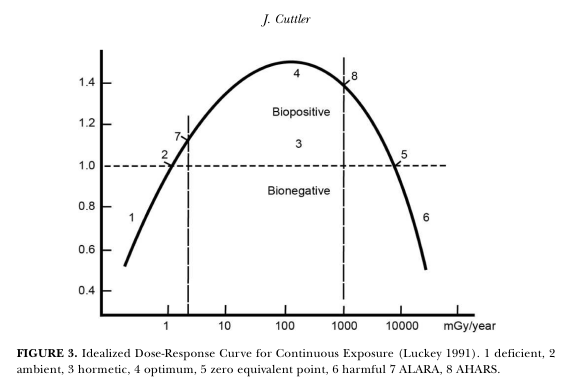 The ideal dose of nuclear radiation to produce a maximum bio-positive effect can be found from the following dose diagram, originally from T. D. Luckey and modified by Jerry Cuttler for clarity in a paper published in April 2012. 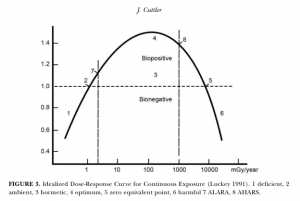 Radiation hormesis ideal dose diagram. ALARA = as low as reasonably achievable; AHARS = as high as reasonably safe. It should be noted that there is almost a 3 orders of magnitude difference! ALARA is the currently used standard resulting in the evacuation from Fukushima area towns. In the discussion below the units shift from microsievert to millisievert. To make this clear, we have shown the units as either Micro-Sievert or Milli-Sievert in the discussion. You can see from the above diagram Figure 3 that bio–positive effects can be seen to peak at 100 mGy =100 Milli-Sievert per year. A sievert is equal to a gray for calculation purposes. 0.000011 * 24 * 365 = 97 Milli-Sievert/year which is close to optimal. Why not find your own with a geiger counter or UV light. A UV light is a very easy to use tool to find them. Better than a geiger counter. They MUST be glass and then if they glow under black (UV) light they are guaranteed to be uranium glass. The beads are commonly available, particularly from the Czech republic where they are traditional. Check your local bead shop. Each bead is always in the range of 0.5 to 1.0 Micro-Sievert/hour output. All modern uranium glass beads are 2% uranium. One medium sized bead (1 cm across) produces 1 Micro-Sievert/hour. These are my standard beads which I can sell if you cannot find them in your area. We would prefer that you find a local source of Uranium Glass Beads, but we can send some out on special request or suggest suppliers. Ours are also calibrated but with the wide range of strengths shown by the above chart that are biopositive you can see this is generally not needed. 5 beads in the 1 centimeter diameter size will do the job. 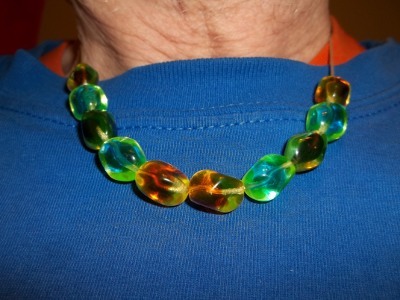 Someone will need a geiger counter and they can help many people in your town to find true uranium glass beads. A UV or Black Light is another option to identify uranium glass beads because they glow green under UV light. The key fact is that GLASS beads can only be made to fluoresce with the addition of uranium. Plastic beads are useless! Uranium glass is widely available, having been popular worldwide since the 1830s. Some sources suggest that uranium glass was used in ancient Roman villa tilework in 70 AD. Uranium glass is still produced today for specialized markets such as beads, marbles, stained glass sheets for church windows. as well as for cups and plates, bowls etc. Boyd Art Glass or Mosser Glass, both of Ohio are examples. There is an abundance of this kind of items in antique stores and it is fun to track them down, either with a geiger counter or a portable black (UV) light. I prefer the light because it is quicker. There is no shortage of ideal strength glass materials. They are very safe to handle and approved for jewellery. In the picture of myself below I am wearing 8 uranium glass beads that together produce 6 Micro-Sievert/hour. This results in a yearly dose of 52 Milli-Sievert/year. This will reduce cancers by about 40% as well as reducing infectious diseases (almost as well as 100 Milli-Sievert/year.) Wearing the beads below I have experienced the first winter of my life with no colds and no flus. My immunity is usually poor and for the last 40 years I have been sick for 1 to 2 weeks every winter with multiple colds and I almost always get the flu. Time will tell if this trend continues … but I am unlikely to give up using the beads. Glass Beads made from traditional Czech Republic 2% Uranium Glass. The set gives off 6 uSv/hour. You can see from the diagram Figure 3 that doses from 10 Milli-Sievert per year to 1000 Milli-Sievert per year score at least a 35% reduction of cancers. This is a range of two orders of magnitude that is bio-positive! There is therefore a very wide range of dosages that produce the identical degree of protection within 5%. This means that by choosing a lower but effective dosage for protection of a population you will mitigate the problems for someone whose immune system is weakened. So when data becomes available it is expected that minimal levels would be adjusted according to the finding of the research in this area of health study. The use of a geiger counter is highly recommended. You want to know if you are receiving enough radiation but not too much. Alternatively to purchasing a geiger counter you could purchase pre-calibrated sources.